It was a wonderfully relaxing Thanksgiving weekend with lots of quality family time to be had!! The Thanskgiving dinner turned out wonderful, I think I need to thank my sous chef Madison for that. She caught sight of my typed schedule and would point out whenever I was off schedule. I had to inform her how that was just a guide, not a strict schedule. I have no idea where she gets this personality with 2 parents who are so laid back about everything!! Friday I was up and out the door at 5:00 a.m. I am not even sure why since there weren't any killer deals I had to have. I stayed on the perimeter of the craziness and was home by 8:00 with a good chunk of shopping accomplished. The day was looking nice so we took off on a hike in attempts at the perfect Christmas Card photo. Here are some of the ones that did NOT make the cut!! And by 6:00 in the evening the Christmas tree was set up and ready for decorating! With just one small issue. I knew some of the lighted branches were not working last year but I was able to turn them into the corner without issue. I considered buying a new fake tree and we discussed doing a real tree this year but I eventually convinced myself it was an unnecessary expense so we got the tree all set up to find LOTS of branches unlit. What to do, what to do??? We decided just to string some lights onto the branches and the problem would be solved. Well.....2 days later THOSE lights decided to go out so now I have a fully decorated tree with a bit of a flaw. Anyone who knows me knows I am a bit of a freak about my tree (though I have had to give up a LOT of control the past 2 years with my assitants wanting more of a say in things!). Now I have a decision to make. 1. Let it be as is and try not to notice the huge flaw. 2. Take down decorations and light strings, put up new light strings and redecorate 3. Start over with a new tree. I have a feeling options 1 and 3 are both not going to happen so we will see when I start the process for #2. The girls and I stayed in MATCHING Christmas pajamas for 40 hours straight from Friday night to Sunday morning!! I'll just let you use your imagination to picture me in the middle with my Christmas owl pj's! They aren't quite as cute on a grown adult, but the girls were absolutely thrilled with us all matching so it was worth it. Not sure what Tom thought of the insanity! Hope your weekend was filled with happy family memories like ours!! Heading to bed, ready to get started with the feast preparations in the morning. Complete with typed time-line and post-it-note labeled baking pans. Yes, I am a nerd and I am proud of it!! Wishing you all a wonderful Thanksgiving Day. Our family has so much to be thankful for this year! (I am actually cheating this year and just doing a turkey breast since I feel so much goes to waste. (Okay, may not be famous to the outside world, but my family loves it!! Maybe I will post the top-secret recipe later this week!! 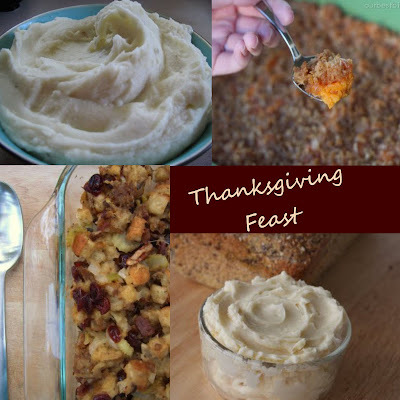 Thanks to Our Best Bites for the great new recipes and photos. This is my new favorite "go-to site" when looking for an extra special cooking project. Check it out! And the most important step: WASH!!!! 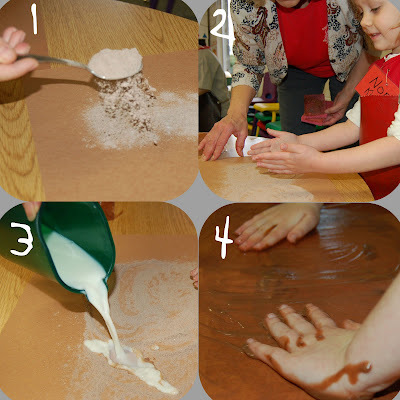 This activity is so much fun for the kids and a very worthwhile activity to get them fully immersed in the senses lesson. Amazingly, the paper dries and can be saved. We will glue some of the fun photos onto the pudding paper to go in their yearly scrapbooks. No, no not me. I wish I was so organized and prepared. I have all sorts of plans in my head but haven't started any of them in reality yet. BUT Nora, on the other hand, decided to get a head start on Christmas cards today. While I am still hoping to capture the PERFECT photo to use for the family one. Maybe I can just sneak our names on hers and call it good? They are pretty adorable with her writing and signature Baby Beluga drawings!! 60 hours away at a scrapbook retreat was just what I needed after the hectic 2 months we had had. It is amazing how I came back feeling refreshed and renewed, even though I only slept a total of 9 hours over the 2 nights! The other retreats I have gone on have been small intimate ones with 12-14 people who all know each other. This one was much larger with 65+ people in a large conference room. I really enjoyed the energy and walking around looking at all the different styles, tools and ideas was quite inspiring. It was also nice to have a small shop set up right in the room for buying emergency items. I see the benefit in both styles and really as long as I have a table, chair and time I am not going to complain! As great as the scrappin' was, time with good friends is even better. I had such a great time with my roomie Karin. Lots of laughs were had! As always, I wasn't quite as productive as I had hoped but I really like the pages that I got completed. I also did some new techniques like sewing, painting and masking on the pages. FUN!! I am going to work on the perfecting posting layouts so I can share some more but here is a sneak peak of one of my favorites. 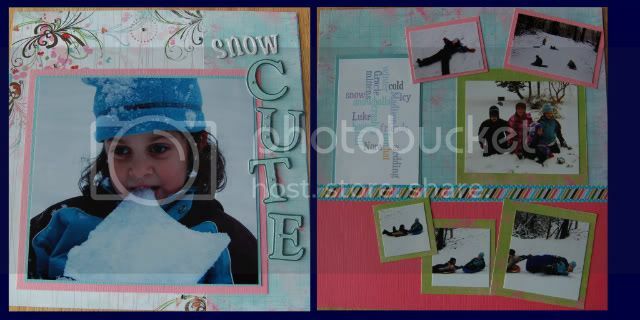 I am going to use it for a fun sledding scrapbook page at my scrapbook retreat this weekend. Wouldn't it be fun to make one for every member of the family? One of my favorite crafting blogs Skip To My Lou has organized this great homemade gift guide. So if you are like me and looking for some fun and unique gifts to make for family and friends this year go on over and take a peek at her selection. Soccer season is behind us for another year. As much fun as it is, it is always a great feeling to be DONE. PTA commitments are minimal for the month. Regular family dinners at the table will happen more than twice a week. The beauty of fall out the windows and the crisp cool mornings that just beg for the heater to kick on and warm the house. The anticipation for the holiday season and all that it entails. I have craft projects for homemade Christmas gifts all planned in my head and I can't wait to get started. PLUS I have extra excitement for the holidays this year since we will be hosting Christmas with BOTH sets of grandparents. I have all ready warned Tom that I am going ALL OUT for decorating and planning! Let the festivities begin! I am going away for the weekend on a girls' scrapbooking retreat. I also was reminded of this time last year and the same feelings. Before the thoughts of Project 365 even entered my head I started a daily photo project for November. 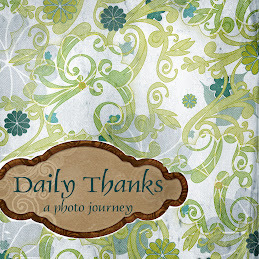 It was my Daily Thanks project that I loved. 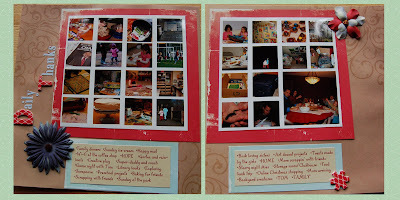 Click HERE to see all the photos and here is the simple scrapbook layout I created with them. Happy November to you. Hope that you can relax and enjoy the month! !